A Portuguese web model who weighs in at around 190kg has revealed how a terminal diagnosis inspired to her eat everything she could in an attempt to become the world's fattest woman. The 26-year-old, known as 'Lilith the Cenobite', told the Daily Mail she has been part of the "feedism" community for more than three years. She hopes to top the weight of the world's largest woman, which is currently at around 286kg. Lilith says she used to suffer from anorexia, and grew up homeless so "food was hard to come by." "Food was this great big forbidden thing that existed just to torment me," she added. Her feelings towards food changed in around 2015, when she was reportedly diagnosed with hepatic encephalopathy, a form of brain cancer. The terminal disease is linked to cirrhosis of the liver, and Lilith says it gave her the freedom to "indulge in her guilty little secret". "I decided to eat as much as I possibly could - I want to gain; break records; leave behind something historic. My weight gain, weight loss, and weight stagnation are all beyond my control," she says. She's known as a 'feedee', paid to gorge on large amounts of food on camera for the gratification of others. "If you're a feedee, it's a fetish involving eating, stuffing, and gaining weight. If you're a feeder, it's a fetish around feeding someone; stuffing them and helping them gain weight. "I literally don't eat anything at all unless it is provided to me by a feeder." The model regularly requests food from her online social media following. "Want me fatter? Then help a fatty out," she tweeted last month. 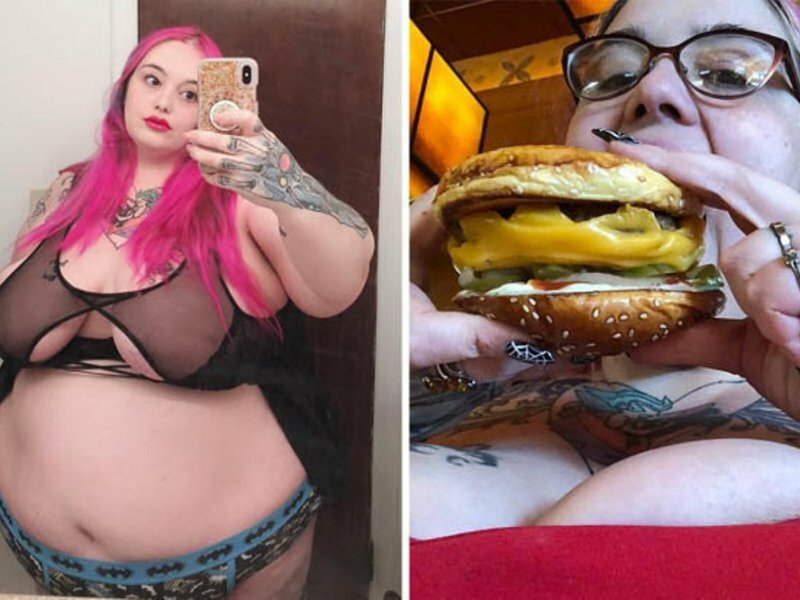 "Given that I only eat if and when someone chooses to feed me, my weight is entirely at the whim of the feedism community. Hopefully I get fed enough to reach my goal," she told the Daily Mail. "As a web model and video star, many of my fans watch because they like the fact I keep growing."